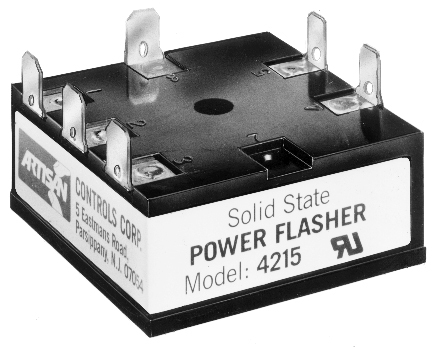 The model 4215 is an AC power flasher that provides AC or DC control of AC load circuits. Optical isolation between the input control voltage and output load voltage permits input control to be different from the output load voltage. When the control voltage is applied, the model 4215 begins a flashing cycle, with the output switch turning ON first. The load circuit will continue to flash for as long as the control voltage remains applied. The model 4215 provides zero voltage output switching of AC loads up to 10 amperes. The flash rate is fixed at a 50% duty cycle of the fixed or adjustable flash rate period. Available in both fixed and adjustable timing models. Control Voltage DC (5, 12, 24, 48), AC (12, 24, 48, 115, 230) 50/60 Hz. @ 5mA max. Load Voltage AC only (12, 24, 48, 115, 230) 50/60 Hz. Timing Mode Flasher (opto-isolation between control & output voltage). Adjustable Flash Rate 1 to 60 flashes-per-minute and 5 to 250 flashes-per-minute. Repeatability Of Flashing Period ±1% at stabilized operating voltage temperature. Recycle Time Operating voltage must be removed for a minimum of 200 milliseconds to assure that the flasher and output circuits are reset. Output Rating 70mA to 5A inductive with inrush currents to 40A for 8 milliseconds. Extending Rating Operation to 10A by mounting the timer heat sink base on a metal surface and maintaining timer heat sink temperature to less than 90°C. Output Switch Characteristics 3 volt drop across output switch when ON, 4mA leakage when OFF. Dielectric Strength 1500Vrms all terminals to heat sink, 1500Vrms from control voltage terminals to output terminals. Control voltage is optically isolated from the output switching terminals.